Water conservation is an important design consideration in all Arizona landscape. In the tri-cities area, water is particularly precious. Because all landscaping requires some water, it is wise to install irrigation that carefully monitors and distributes adequate but not wasteful amounts of moisture to the soil. This is especially important for plant health during our hot, dry, windy months. A timed, irrigation system is one of Jeff's Landscaping & Yard Service specialties. Automated underground systems for irrigating permanent landscaping are efficient and effective for maintaining landscaping. Drip irrigation, known also as trickle irrigation, is a system of hoses and tubes with small nozzles (emitters) that can be designed to fit any lawn and gardening situation. The water is sent directly to the plant's root system, so that the water reaches its destination without evaporation and waste. View some examples of lawns we have installed. 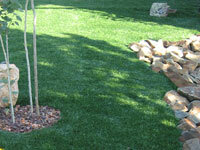 Would you like some green grass included in your landscape? Call Jeff's Landscaping & Yard Service toll-free at (877) 820-0863 or Request a Quote directly from our website.